In Explore Predators and Prey, kids actively learn about body tools and behavior strategies as they test their own abilities to hunt and hide in a series of science-minded activities. I will be completely honest, I’m quite a pacifist so thinking of how predators catch prey isn’t exactly my favorite subject. However, I try to suppress those ‘yucky’ feelings when I discuss these things with Brooke because it is quite fascinating to learn about the strategies predators and preys use and how their physical and behavioral adaptations impact their environment. Explore Predators and Prey! With 25 Great Projects is geared towards readers ages 7 through 10, that explore the predators and prey affect nature that is a perfect way to provide additional learning to your child’s science class. 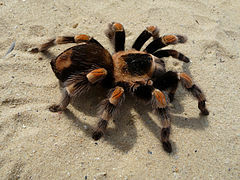 While tarantulas may look scary, most are not dangerous to humans. Why are hawks and foxes so great at catching their prey? Animals like hawks have extremely sharp eyesight and hawks have very sharp beaks, so their bodies are designed to help them catch prey. Prey, such as mice and rabbits, on the other hand, have fantastic hearing and can move quickly to escape their predators. It’s interesting that predators and preys are closely integrated with each other and the surrounding environment and how one change in a population can have lastly affects on the entire life cycle. Explore not only talks about the physical and behavioral qualities of predator versus prey, it also discusses how the repercussions of change can affect nature. The book also encourages readers to consider how their own actions have an affect on the environment. 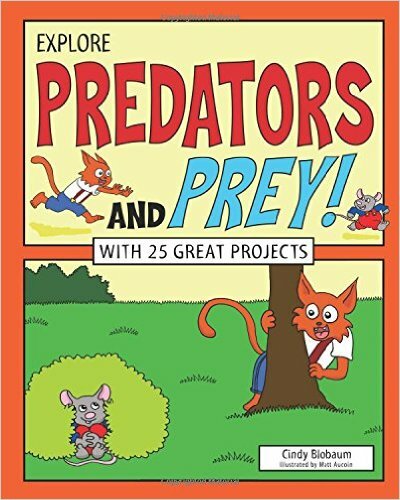 I really enjoy how Nomad Press makes science subjects really fun by adding little facts, colorful cartoons, and additional resources to online and video content to make learning about predators and preys entertaining and accessible for early learners. Projects include interesting experiments to observe, models and maps to create and ways to compare and contrast the predator and prey dynamics. This is a perfect book for home learning for little scientists or for teachers to use and explore in their classrooms with their students. Love. About the Author: Cindy Blobaum is an educator and naturalist who has written several books for children, including Explore Night Science!, Explore Gravity!, Explore Money!, and Explore Honey Bees! for Nomad Press. She lives in Des Moines, IA, with her family. About the Illustrator: Matt Aucoin hold’s a master’s of fine art from the Center for Cartoon Studies and teaches drawing to preschool-age children. He lives in Windsor, VT.
About Nomad Press: Nomad Press is a Vermont publisher that is focused on educational interests for young children. Nomad is interested in engaging children through interactive projects and exploring history and science behind many intriguing topics. 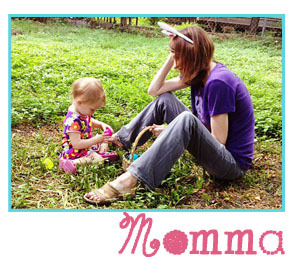 Check out the great Nomad Blog for some fun projects to do with your kids!